an electronic version of a printed book which can be read on a computer or a specifically designed handheld device. The obvious definition is that an e-book is an electronic book that can be read digitally on a computer screen,Smart phone screen, Tablet Screen, a special e-book reader, a personal digital assistant (PDA), or even a mobile phone. In other words, e-books are consumed on a screen rather than on paper. However, underlying this simple and seemingly obvious definition are some important distinctions that may make an e-book something other than just a “PDF version of the printed book.” These differences lie in the electronic nature of e-books, which are changing the nature of what a “book” is within an electronic context. The e-book landscape is changing, and in some cases changing very rapidly. eBooks offer many opportunities for institutions to expand the supporting role of the library, to enhance learning and teaching, and to enrich research. In preparation for these opportunities, technical and cultural challenges need to be addressed so that institutions can successfully expand their adoption and usage of e-books. library that could be retrieved regardless of time and space. On the other hand, the software that enables eBooks to be readable on personal devices usually provides features such as full text searching, customizable font size, mark-up, or even note taking (Lucia, 2001). Moreover, the content of an eBook may be supplemented with multimedia, which assures a greater variety of information to be displayed simultaneously. Hyperlinks can be used to bring the student, while reading the text, to a number of educational resources that cannot be included in the text of the course, such as multimedia materials, interactive exercises, quizzes, discussions, etc‖ (Mazza, 2008, p. 2). Therefore, eBooks may serve as learning tools especially among students who are comfortable with the technology. In the last few years, the use of ebooks by the general public has become mainstream. Driven by developments in ebook technologies as well as by surges in usage of ebooks generally, within Higher Education and Further Education institutions the scope for adoption of ebooks has steadily increased. As many institutions have started the process of adopting and using ebooks, however, they need to be aware of issues as they embrace and embed ebooks within classrooms, research, libraries, and various adoption and usage scenarios. AP SCERT has developed our Academic text books, Modules and Handbooks to e-books. And APSCERT Officials has launched official website for ebooks and Handbooks. These books are copyrighted. Tablet, Computer users can download particular ebooks and handbooks in your devices. Now e-books are now available in our APSCERT Official Website. These e-books are very useful to teachers. I am also using these e-books in my Tablet and Laptop. I am also using these e-books in my class room interaction. Note: Subject wise, Class wise and Language wise ebooks are available on apscert.gov.in . Flash news: If website is under constructing, Files are not downloading. Best view for Open this website in Mozilla Firefox. 1. First got to Official website home page URL by typing "apscert.gov.in" in any browser and If you want ebooks, you should click on "ebook" button or If You want download Hand Books, you should click on "Hand Book" Button in website home page.. The following "apcert home page" screen appears. 2. Then click the Language drop and down menu and choose your language. 3. Click the Class drop and down menu and choose your class. 4. Click the Subject drop and down menu and choose your subject. 5. Click the Book title drop and down menu and choose your title of book. 6. 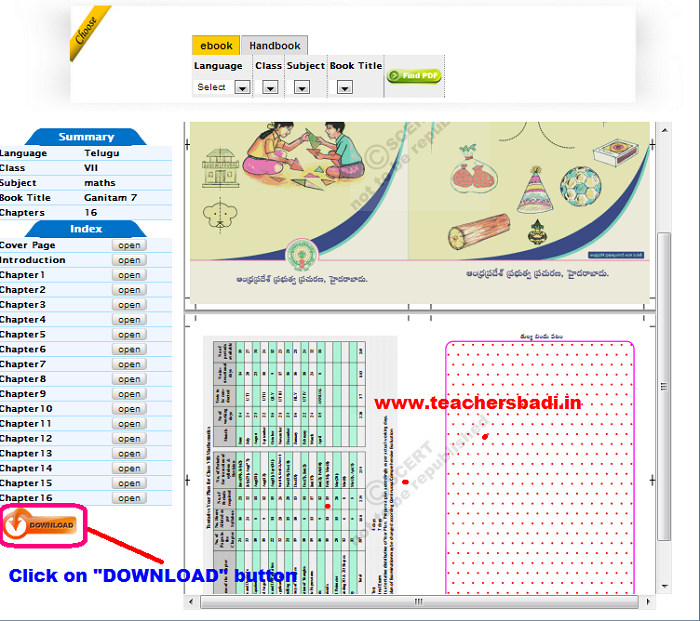 Then click on FIND PDF button. 7. Your selected ebook/Hand Book preview appears like below image. After click on download button. After Your file starts downloading in your device. Sir, the link to download the eBooks is not working. Can you please share the new link. Why 10th class books are not provided? Any reason..? Can i get previous editions of the books in pdf format? There is no x class books.If u provide the x class books then only this site is useful to us. Nenu 1994 batch telugu medium. Naaku aa old books kavali. Edaina salaha ivvagalaru. Pratheykinchi Telugu, English books (Main book, non-detail). Naaku konnisarlu malli chadavalanipinche manchi kadhalu unnayi andulo. Kaani pusthakalu elaa vethakalo teliyatledu. here 10th class books are available. i have downloaded. Sir Gud after noon. Naku 6-10th class AP Telugu academy science and social Books kavali.